Read-a-Thon: Book 4. Do I hear 5? Book 4: Completed! I went tearing through the latest Berger and Mitry mystery, The Blood Red Indian Summer by David Handler. I like that series, and this book was a quick thing to read. Usually it’s around this time of night (morning!) that I get to feeling like I’m the only awake human on earth. But this book’s characters are keeping me company, so that lonely feeling is greatly diminished this time around. Oh, people are lovely. A dear friend (thank you!) just sent me this YouTube video via Facebook. And the good news for me is that it’s the first book in a series. I think there are three books in the series thus far, so that’s happy times ahead. Wishing I had book 2 here because I would read that thing right now, but no.such.luck. So far today, there have been murders and more murders in every book I’ve read. And probably the next book up: more murders in there! The reason I think this is working so well for me today is that mysteries and thrillers make you want to go tearing through them at breakneck speed, and that’s Read-a-Thon style. Those introspective quiet novels about family relationships… on Read-a-Thon day, No. Since it’s still hella early (only 10:20 p.m.!) 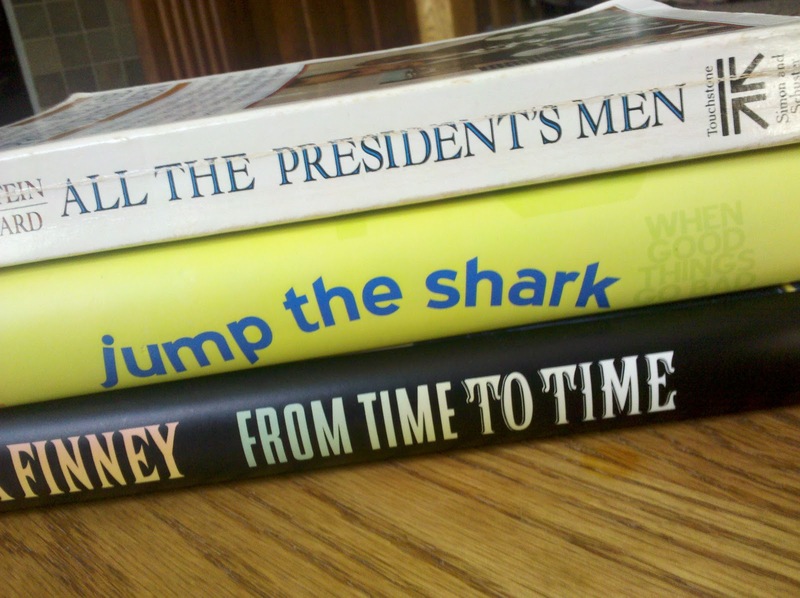 I’m wondering if I might make it through 2 more books…? We Shall See. Hooray! I’ve finally finished Book 2! Although I liked The Black Echo by Michael Connelly very much, by page 375, I was getting a little squirrelly. I’m pretty sure that wouldn’t have happened if I’d read it normally (rather than all in one big stretch). I just now read the descriptions of two of the books I checked out (a children’s book and a young adult book, each by an author that wrote another book I read and loved) and neither one of them sounds like my cuppa tea, plot-wise. What else I’ve been doing: went to a local cafe; visited the Read-a-Thon page; visited some blogs; ate dinner while watching a couple of TV shows on Hulu; drank some coffee in the afternoon; ate an apple, a chocolate toffee thing, and some pizza. Oh — and I had pasta for lunch. I’m a hungry thing. 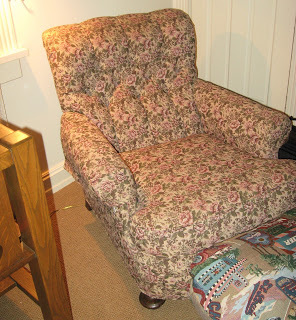 Other stuff: Got terribly sleepy during the sofa phase. Also gave myself a weird shoulder cramp from how I was holding the book. This reading is dangerous work. All the president’s men jump the shark from time to time. It’s Hour 9, and things are good. First off, Midnight Book Girl is hosting a challenge: Use books you have on hand to form a sentence out of their titles. My contribution appears in that photo there. After starting the book What It Is Like to Go to War by Karl Marlantes, I stopped reading on page 6. I determined that this was not a book to gulp down during a Read-a-Thon, so I’m saving it for another day soon. I’ll be back with some stats either when I finish The Black Echo or when I decide to take a reading break. I’ve finished reading my first book of the day, and it was a great choice. I’ll probably 4-star The Sisters Brothers by Patrick DeWitt when I add it to my Shelfari list. And I’ll write all about it later. I got stuff to say. But for now, I’m getting ready to launch into Book 2. I’m not going to announce what it is, because I don’t want to hex it. Let’s just say, it’s one of these. Also — My book line-up today is filled with lots of murder and mayhem. In part, that’s by design, because I’ve included a couple of mystery authors I’ve been wanting to read for a long time. And I intentionally added some faster-paced stuff to the mix. But man, there’s a lot of violent death in my TBR today. That’s jolly! I think I might try to read from every seat in the house today. Why not? Book 2, I hope I like you. Good morning, good people of the Read-a-Thon! We’re a little more than 1 hour in, and I’ve been reading since 7:30 a.m. (even though the Midwest’s start time was 7:00. I am a lazy son-of-a-gun in the morning). 1. I like things to be organized. 3. I like driving fast. 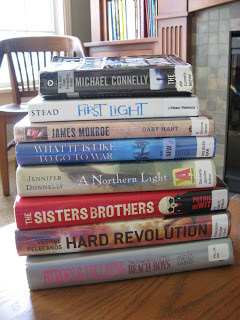 There are 9 books in my Read-a-Thon pile, and I expect to read 4 of them. I’ve also got about 15 other TBRs scattered around the place, so if that first group of 9 doesn’t trip my trigger, I got back-up. pages, number of hours, or number of comments on blogs)? If you’re not liking any given book, bail out. Eat as needed. Visit other Read-a-Thon-ers’ sites and cheer them on. I’m on page 83 of The Sisters Brothers, and I’m liking it lots. It’s got a first-person narrator, and the guys are gruff and brotherly (in the sense that there’s always rivalry, and they insult one another at every opportunity. Since they insult with very few words, it’s entertaining as all heck). It’s less than a week till the Read-a-Thon, so the stockpiling has begun! It hit me that I really should take a picture of the stash thus far. It hit me while I was cleaning the house, which is no surprise. I mean, why dust when you can be piling up books and photographing them? Though the dusting was actually bookish, too. I’m hosting the book club this week, and while the ladies (being in the inner circle and all) have seen this house in a state of disaster, it seems polite to at least whip a dust rag around the rooms before book club night. So yeah, it’s gonna be a good week ahead: book club night, then Read-a-Thon day. Things are good around here. Every time I walk past a little cafe in my town, I think of the Read-a-Thon–because usually I go there on Read-a-Thon day, twice a year. I sit outside at a charming little table and drink coffee and eat something lovely, and I bring my book and sort of read a little bit. But basically, let’s just say it: I’m playing hooky. 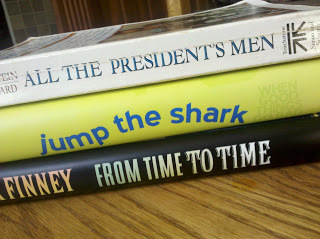 Now I’m starting to add books to my Read-a-Thon reading list, because that sucker is coming up fast! Yes, it’s true. Dewey’s 24-Hour Read-a-Thon is coming to an interweb near you just one month from now. Guys, mark your calendar and cancel everything else that day. We gots reading to do. Once upon a time, this here person would stay up till 4 a.m. reading like it was no big deal. Of course, this here person was only in high school and college when that type of behavior was happening. Now, as a crunky older thing, it just don’t happen like that no more. So I’m taking my slippered and pre-pajama’d self off to sleep. – Choose short books — none over 350 pages. – Alternate between fiction and nonfiction. – Save a children’s book for last. – I did the usual Read-a-Thon thing and ate my way through the day with abandon. All this sitting around really stirs up the appetite, you know? Good night/good morning, all. Hope you all had a great Read-a-Thon!